While it’s taken significantly longer than expected, Azure Striker Gunvolt is finally getting the Japanese Voice Mode on October 20 as part of a 1.3 update. It had originally been announced last year. In the Azure Striker Gunvolt: Striker Pack, this is already included on the cartridge. The Japanese Voice Mode is rather substantial. In addition to restoring voices for all of the characters, the game has been re-localized. 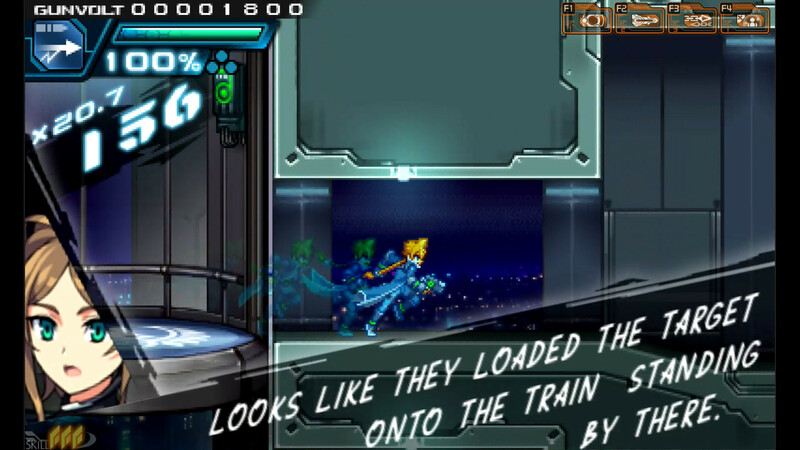 A bunch of dialogue has also been added in as Gunvolt moves through stages. Well Gunvolters, the time has finally come! A year ago, after releasing the Steam version of Azure Striker Gunvolt with the Japanese Voice Mode addition, something that many of you asked for, I personally made it a mission to do whatever we could to make sure that our 3DS Gunvolt players got this feature too. I’m sorry that it’s taken a year for us to deliver on this promise. But, I’m very happy to announce that a Version 1.3 patch that will add Japanese Voice Mode to the Nintendo 3DS version (digital download) of Azure Striker Gunvolt will release on the Nintendo 3DS eShop on Thursday October 20th! For those of you who are not familiar with Japanese Voice Mode, this was a mode that we created for Azure Striker Gunvolt 1 that adds in content that was regrettably removed from the initial release of the 3DS version of the game. Not only does this patch restore the voices to each and every one of the characters, but the entire game has been re-localized to better match with the addition of these voices. This mode also restores ample amounts of dialogue that was previously removed from the game that takes place as Gunvolt traverses each stage. This mode gives a much deeper insight into who the characters are and why they are doing what they do, so I hope that you not just enjoy the Japanese Voice Mode addition, but that you develop a newfound appreciation for these fantastic characters.